My sister and I are in Naha, the capital of Okinawa, a string of islands in the south of Japan. We are at Makishi Public Market in the town centre. 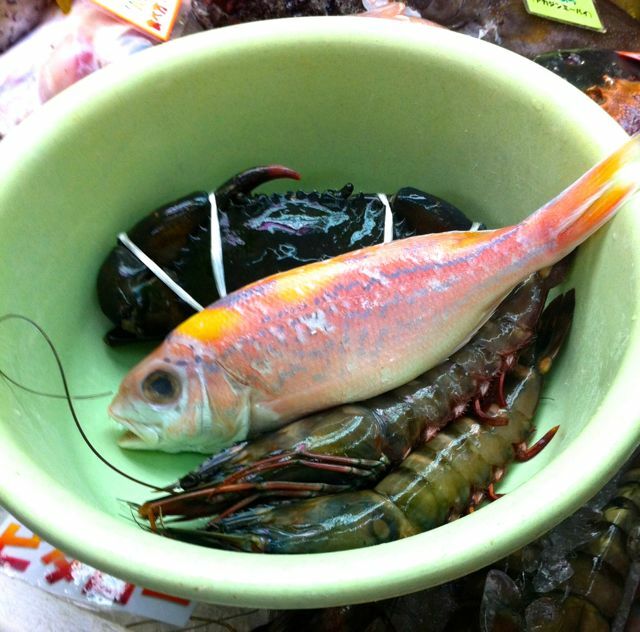 We are looking to buy fresh seafood as we have read that the restaurants upstairs will cook it for you. As the two of us argue over what the sign means, one fishmonger lady and her son hustle us towards their stall. The fish lady gathers a feisty crab, two giant shrimps and a small piece of fish. She suggests boiling the crab, BBQ-ing the shrimp and slicing the fish in sashimi-style pieces. My sister does not eat raw fish because she is an idiot so the fish lady suggests panfrying it with garlic butter. Garlic butter! Yum! We are sold before she has even quoted us the price. She weights our purchases and scribbles ¥3700 ($39) in total on her notepad. She explains that the ¥500 ($5.30) is a cooking fee per person, which is paid to the restaurant. Her son escorts us upstairs with our selection. Upstairs, we order drinks and sides from the a la carte menu. As we wait, we see dishes coming out from the kitchen for other patrons: chilli crab, garlic prawns, lobster soup, tempura prawns… all the ways to ‘condition’ seafood that we couldn’t think of five minutes ago. Our boiled crab now pales in comparison. Nonetheless, we cheer up when our food arrives. The crab and the fish are fresh and delicious! The shrimp needs some sauce action but overall, it’s a top experience but I suggest learning a few Japanese words to articulate how you like your seafood ‘conditioned’. The Makishi Public Market is off the main street in Naha, Okinawa. “My sister does not eat raw fish because she is an idiot” — OK, this cracked me up! And fish cooked in garlic butter is the best. @Imjapan, thanks. Don’t worry, I went back the next day to get a plate of sashimi for myself. @Ax Heaps better than fish markets in Toks. Even though it was much smaller and the restaurants are bit dated, at least you can eat your purchase!